Established in 2010 by Aj "Suga Soldier" Coffee and Debo' "DA BOSS Wakefield, we, the New Mexico Buffalo Soldiers Motorcycle Club - Albuquerque Chapter, are excited to share the enchanting land of New Mexico as the 88th chapter of the National Association of Buffalo Soldiers and Troopers Motorcycle Club (NABSTMC). We are known for our riding through thunderstorms, hail, 100+ degree temps and 30+ mile per hour winds... all just for the LOVE OF THE RIDE! With a passion for the road, you can find us cruising on the streets of Albuquerque, through Rio Rancho, across the Rio Grande or the foothills all the way to the mountains of Taos. Our love for riding also takes us cross-country, from the Pacific to Atlantic coasts. We ride, not just for the fun of it, but also for a cause as we educate the general public on the history and legacy of the 9th & 10th Cavalry of the Buffalo Soldiers. In addition, we are committed to our local community as demonstrated through a variety of community service activities. So If YOU share in this love of the great outdoors and reside in the Albuquerque area, join us as we explore the mountains of New Mexico. If you are a native of this beautiful land, show us the sights. And in return, we will share with you the legacy of the 9th & 10th Cavalry of the Buffalo Soldiers. Lest We Forget... come find out why we ride in their honor, why it is our mission to share with children (and adults) the history of these brave men (and woman)... the Buffalo Soldiers. And if you find yourself captivated by their legacy, then consider membership. But be forewarned... this is NOT a social club nor for those just wanting to wear colors. We are a motorcycle club, all about the business of safe motorcycling, community service, education and honoring the greatness of the BUFFALO SOLDIERS! Are you READY to move FORWARD? CAN you? WILL you? WE CAN, WE WILL and we are READY & FORWARD! Keeping it real, there is no landscape as enchanting as New Mexico, and here in Albuquerque we have already experienced some of the most beautiful scenery in the country. 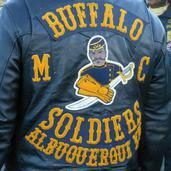 So come join the Albuquerque Buffalo Soldiers as we grow and roll. "Enjoying the Enchantment while Experiencing the Ride!"